Deputy Chief Michael King and Police Chief Gerald Simpson of the Southern Chester County Regional Police Department. The graphic identity for the new Southern Chester County Regional Police Department contains an eagle with widespread wings. In its claws, the eagle holds a ribbon, on which is included “2016," a year that signified not just when the department was officially incorporated, but one that tested the patience of those who dreamed it into being. The seeds of the concept to form a regional police unit in southern Chester County date back more than two years ago, when then New Garden Township Police Chief Gerald Simpson asked the township to consider merging or partnering with other police units as a way to stabilize the costs of providing police coverage. Initially, the concept of forming a regional police unit in southern Chester County garnered the attention of several townships and municipalities. The timing of its placement coincided perfectly with national attention to community policing. On Dec. 18, 2014, President Obama issued an executive order appointing an 11-member task force to develop a report on 21st century policing, in response to a number of serious incidents between law enforcement and the communities they serve and protect. A large component of the report included Six Pillars of 21st Century Policing, which are building trust and legitimacy; policy and oversight; technology and social media; community policing and crime reduction; training and education; and officer wellness and safety. Simpson's idea was not a novel one. Hundreds of communities across the nation have merged their police units into regional departments -- but it was new to Chester County. In theory, it would set the tone for how policing in the region would be implemented in the county for generations. It would create the opportunity to bring all police operations in the southern region of the county under one roof; give each officer and each department the gift to wrap their best skill sets into the fold of a larger whole; and allow for added police protection by virtue of strength in allied numbers. But like a tumbling arrangement of dominoes -- and for a number of reasons -- the townships and municipalities that had latched themselves onto a study to explore the feasibility of establishing a regional police department in southern Chester County began to fall, one by one. As the plan slowly began to unravel, Simpson feared that his idea would become "Simpson's Folly." When the dust cleared, only two players remained: New Garden and West Grove Borough and its five-member police department, who provided coverage to its nearly 3,000 constituents with between 12 to 16 hours a day. 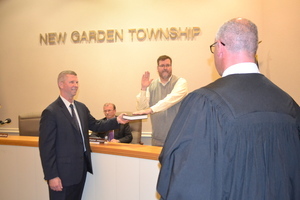 Over the course of several meetings and discussions between the Borough's Public Safety Committee and Borough Council, it soon became evident that joining forces with New Garden Township was a good idea. "I thought then that it was a tremendous amount of work to do, only to potentially see it come apart," Simpson said. "Yet, we were able to reset our compass with a partner who ended up being the best fit. West Grove had the needs that we were able to offer. In turn, they had something they were able to offer New Garden in order to allow us to reach the stability we wanted in our coverage." Officer Raymond Sullivan was sworn in on April 13 as the newest member of the regional police department. On Jan. 1, 2017, after several months of meetings, proposals, contract negotiations and approvals, the Southern Chester County Regional Police Department went live. Two weeks later, before an audience of more than 250 at the Kennett Middle School, Magisterial Judge Matthew Seavey swore in 19 officers, each of whom received their official departmental pin from the person of their choice. Those sworn in included officers Justin F. Busam, Matthew T. Cordone, Eric S. Shallis, Joseph Fetko, Christoper Connelly, Richard N. Townsend, Stephen M. Madonna, Benjamin Brown, Jeremy A. O'Neill and Ryan Kushner; as well as first class officers Justin T. Fonock, Jason L. Ward, Mario M. Raimato, Jr., Joseph Cooper and Gerard Lindenlauf. In addition, officers John M. Gibson, II and Joseph P. Versagli, III were sworn in as corporals; Joseph F. Greenwalt was promoted to the office of sergeant; while Michael King and Simpson were sworn in as the department's deputy chief of police and police chief, respectively. The regional unit provides 24-hour coverage, seven days a week, 365 days a year to both the borough and the township; employs 15 full-time officers, eight to ten part-time officers; one administrative assistant and one records clerk. The unit works out of two locations: New Garden's temporary barracks on Gap-Newport Pike, and West Grove Borough's police offices in the borough's administration building. The annual cost of the regional department will be divided according to population: The township, with close to 13,000 residents, will pay for 80 percent of the yearly budget, and the borough, with nearly 3,000 residents, will be responsible for the remaining 20 percent. The total budget for the new department will be $2.358 million – an investment of $128,710 per officer, a lot lower than many departments invest in their officers, some of whom are over $200,000 per officer. While Simpson is charged with the task of overseeing the entire department as its police chief, Deputy Chief King heads up day-to-day operations and scheduling, which will provide regional patrol to three areas of coverage, with at least two police vehicles patrolling each: north of Gap-Newport Pike into Toughkenamon and south of Gap-Newport Pike into Landenberg, which will be patrolled twenty-four hours a day, seven days a week; and throughout the West Grove Borough, which will be patrolled from 7:00 a.m. to 1:00 a.m., and quite possibly extending until 3:00 a.m.
"We didn't just merge two different data base systems, we merged two families as well," King said. "I am pleased with how things are going, but I shouldn't be surprised at our progress, because the process of this merger was very well thought-out, and we took the time in the months leading to its beginning to plan correctly." It's part of a concerted effort by the regional department to engage the entire community it serves. Sgt. Joseph Greenwalt, who is heading the Community Service Unit, has engaged his unit in a lengthy roster of community outreach initiatives, including establishing a constant connection to area youth, especially those who frequent the After-the-Bell Program in the Kennett Consolidated School District, and Garage Community & Youth Center in West Grove. Every week, officers stop by the Garage and have individual conversations with youngsters who visit the youth center, "just to make sure everything is good at home," Greenwalt said. "If we're going to call ourselves a community service unit, it's important to become involved with these young people." By the summer, Greenwalt expects complete a community policing policy handbook that outlines the department's philosophy. "Community policing isn't just walking around a community," he said. "It's dedicating a day to ride our bikes through the neighborhoods and allowing ourselves become visible, not just ride around in our vehicles with our windows up. It has to become more than an action, but a philosophy and then a directive, one that the entire patrol division can take with them to the communities they serve." If there is one blemish to the operations of the newly-merged unit, it is a temporary one. As a result of a severe mold problem that forced the close of the former headquarters of the New Garden Township Police Department, Simpson and his staff have been forced to conduct business in a connected splotch of temporary trailers on Gap-Newport Pike. On Feb. 21, Sean Goodrick and Jason Maguire of the Wilmington-based architectural design firm Tevebaugh Associates gave a presentation to the New garden Township Board of Supervisors that cracked open the doors to the plans now for a new headquarters. The 11,716-square-foot, single-story, L-shaped facility will include a 400-square-foot lobby and a 540-square-foot community multi-purpose room; a secure administration area, which will include offices and a conference room; a detective bureau area and interview and testing rooms; storage and locker rooms; and holding cells and two sally ports for transportation of the incarcerated and storage of vehicles retained as evidence. The design and construction for the facility will go out for bidding this summer, and estimated that construction should be completed by October 2018. Before construction begins, the now closed site will be demolished and the temporary police facility will be moved off the site. While the new facility is being built, the regional unit will use temporary space. On Aug. 15, 2016, New Garden Township's supervisors gave final and unanimous approval to the sale of the township's sewer system to Aqua Pennsylvania Wastewater, Inc. (Aqua) for the price of $29.5 million. At several public meetings since the sale, New Garden's appointed and elected officials have said that a portion of the proceeds from the sale will go toward the construction of the new police facility. Simpson believes that the need for a new police facility has been the number one issue facing the New Garden community for some time. "I know we have road construction and improvements we need to do, but from an infrastructure standpoint, you have a professional police organization that has been operating in some terrible working conditions, for some time. I am so happy to see this board [of supervisors] -- all of them, and Township Manager Tony Scheivert and others finally see that, and put energy to this, with a purpose of finding a solution and getting it to a resolution." When Corporal John Gibson first began his career as a police officer in 1985, under former police chief Gerald Davis, he said there was one traffic signal in the middle of Toughkenamon, Penn Green and Newark Roads were controlled by stop signs, and Somerset Lake was not yet a lake. Even then, he said, the talk of police merging was on the discussion table, based on how to properly police a growing population that was beginning to call the Landenberg community home. "As time goes by, we have had more and more people coming to the area, who are coming here from areas that had full-time police service," Gibson said. "It's going that way and it's been building up to this. I think this is going in the right direction, and this is the future of policing in this area." King said that the 24-hour, seven-day a week operation of the merged department, now in its fourth month, has already been embraced enthusiastically by the staff, and that its impact has already been felt by community residents and business owners. "If I could use one word to describe our current operation, it would be 'Legitimate,'" King said. "We all just feel that we are more legitimate as a professional police organization now, as opposed to going about policing on our own. A lot of that comes from the resources that became available because we merged." In an interview he gave to the Chester County Press in 2016, Simpson was undeterred in his belief that a regional police department would gradually -- and eventually -- change the way Chester County looks at policing. "I'm confident that I have great people around me -- great officers and personnel -- to handle the mission that's in front of us," he said. "We will stabilize our coverage, beef up our administrative staff, and improve our investigations. By putting our two departments together, we can deliver public safety better. "We're better together than apart."